But people need food, and producing that food comes with a significant carbon footprint. Experts say this footprint will continue to grow to meet the food demands of a world population that could tip 9 billion people by 2050. Addressing this problem requires ingenuity, and the ability to balance environmental impact with the reality that farmers today and in the future must remain competitive. After all, true sustainability means economic, as well as environmental. Some jurisdictions are looking at ways to reward farmers, financially, for incorporating more sustainable farming practices (even though farmers often argue that as stewards of the land, they’re already taking such measures — their livelihood, after all, depends on healthy soil and productive cropland). But in order to take this initiative from theory to reality, governments need policies that allow farmers to generate and get paid for carbon credits, which can then be sold to large emitters to reduce their carbon footprint. Alberta, Canada has just such a policy in place, and is quickly becoming a beacon for progressive governments around the world looking to set up a program that encourages sustainability on farms, and rewards farmers who already have such practices in place. For the purposes of this blog focused on farming, we’ll set aside methane, which is primarily the result of livestock operations. Just by its nature, farming produces high emissions through the basic act of growing food on land. Tillage of fields releases carbon dioxide and nitrous oxide that has been stored in the soil. Farming also uses fossil fuels and fertilizers. This isn’t news to anyone. Farmers have been adopting management practices such as conservation tillage and a greater focus on crop rotation selection for many years now. In no-till farming, unharvested crop stalks and other plant matter is left behind in the field. This stored carbon sinks into the soil instead of being stirred up and released into the atmosphere, which reduces GHG emissions, improves soil health, and cuts down on fuel needed to harvest the stalks. Nitrous oxide, a byproduct of nitrogen fertilizer, is another key greenhouse gas. It causes specific environmental concerns. 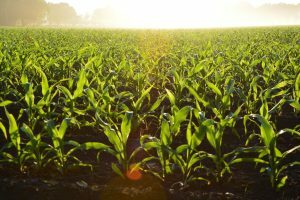 If fertilizer over-applied or applied incorrectly, nitrous oxide can either volatilize into the atmosphere or leach off the land, polluting nearby water sources, or public or private lands. Alberta farmers have been tapping into a carbon credit program since 2007, when the Canadian province brought in North America’s first multi-sectoral greenhouse gas (GHG) regulatory framework. Since that time, Trimble’s Carbon Credit program, which was folded into the company as part of its acquisition of Agri-Trend in 2016, has sold over 3.5 million tonnes of agricultural carbon offsets, returning a hefty $40 million plus into the pockets of Alberta farmers. Program manager Charlie O’Donnell says it’s a great example of how governments can work with farmers to help achieve international climate change mitigation initiatives. It’s a win for farmers, who get paid for the carbon credits they earn by using sustainable practices; it’s a win for large emitters who can buy those credits to reduce their emissions, and it’s a win for the planet. O’Donnell says farmers have never been more excited about joining the program, and it’s clear why. The value of a carbon credit is $30 per metric tonne (or CO2e), effective January 1, 2019. This represents a 50% increase over previous years and is expected to increase 66% by 2022. Learn more about carbon credits today!